Am I putting my kickstart file in the right place? @robertkwild The syntax is slightly different from SYSLINUX style, but there are a lot of examples of how to create menu’s throughout the forums and on the WIKI. These are just some of the many numbers of examples that hopefully can help you out. 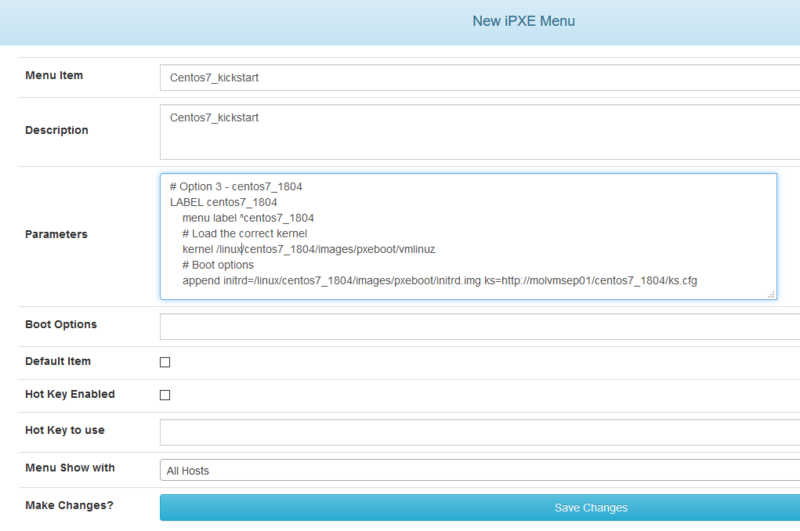 instead of editing the file - “/tftpboot/pxelinux.cfg/default” i add a new custom menu on the fog web gui? @robertkwild Why are you using syslinux to pxe boot? That is not even within the scope of FOG. FOG uses iPXE for its boot environment not syslinux. You are making things way to hard for your self. Typically to launch the distro’s installer its a kernel parameter passed from the boot launcher. With iPXE you can use tftp, http, or nfs protocols. I think that post above uses all three at different times. As Sebastian said, you just need to use the right directory root based on the protocol. @robertkwild When a client does PXE boot it needs to be able to load the files from the PXE server. This is usually done via TFTP protocol which can be a bit slow. iPXE which we use is also able to load files via HTTP and other protocols. But still the files need to be in the right places. /root/… definitely makes no sense! I think you need to read up on this topic. We have many posts about PXE booting Ubuntu in the forums. Give it a try. If you can’t get it to work then post here with specific errors or problems you see. We should be able to help.